Extraordinary Residence at 7 Fountains. 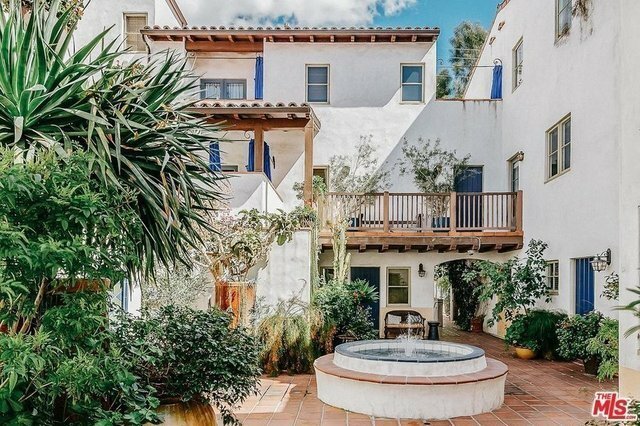 Quintessential Spanish Revival Courtyard Architecture on gorgeous Harper Ave. 2 bedrooms + loft/office with private entrance / 2.5 baths. Old world Hollywood character with modern luxuries abound. Exquisitely upgraded with high-end finishes. Incredible natural light with bright exposures and privacy. A two-story living room with wood burning fireplace, Streamline European kitchen with Subzero. Stunning Master Suite offers a private rooftop terrace with views of the Sunset Strip and lush hillsides. A true spa like master bath with steam shower & dual floating vanity. All flooded in natural light. The walk-in is fitted with custom Poliform closets. The office/studio is ideal for work & creative needs and has its own private entrance and balcony lined with olive trees (could be used as a 3rd bedroom) Recognized for outstanding design, and winner of several prestigious awards, 7 Fountains was designed by Moule & Polyzoides Architects, built 2000.